The Ordo Fanaticus Club Challenge (OFCC) has come and gone, and for the first time in six years our team came out on top. Traditionally, the winning team goes home with the OFCC bucket filled with donated miniatures from each team from years past. It’s the responsibility of the pervious year’s winning team to bring the bucket back the following year. However, after nearly a decade of successful events, the bucket began to overflow. So last year’s champs, Betty’s Fighting Havenicans, returned with a massive wooden cannon (pictured above) to serve as the mini’s repository for years to come. 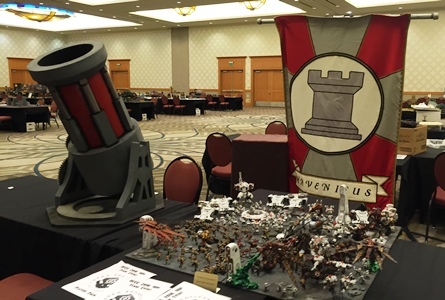 As mentioned in an earlier post, the OFCC is the only major Warhammer 40K event in the region that does not place its primary emphasis on “Best General.” Of course winning games factors into your overall team score, but it is by no means the end all be all. Painting and sportsmanship also weigh heavily. Regardless of where we ranked in any given category, we’ve always had a great time. This year was our best yet. I’d be naive to say that winning had nothing to do with it. Of course it did. But that aside, our minimum goal at any event is to get in five good games against five painted armies. Something OFCC consistently delivers. As an added bonus we had a great time drinking with players from other teams and got to see some amazing presentations of beautifully painted armies. The Riders of Brohan and The Emperor’s Neckbeards had especially impressive displays. There were also some fantastic gaming boards submitted by players for use at the event. On one board, players got to battle aboard an ork airship. Its participant and organizers consistently put their best foot forward. All in all, I can’t imagine a better event and look forward to OFCC 2017. To see Inside the Gamer’s photos of the event, visit: insidethegamer.com/ofcc-2016. To learn more about the Ordo Fanaticus, visit: ordofanticus.com. Congrats! Good to see y’all again, hopefully we’ll end up matched against you next year! Looking forward to OFCC 2017!! !